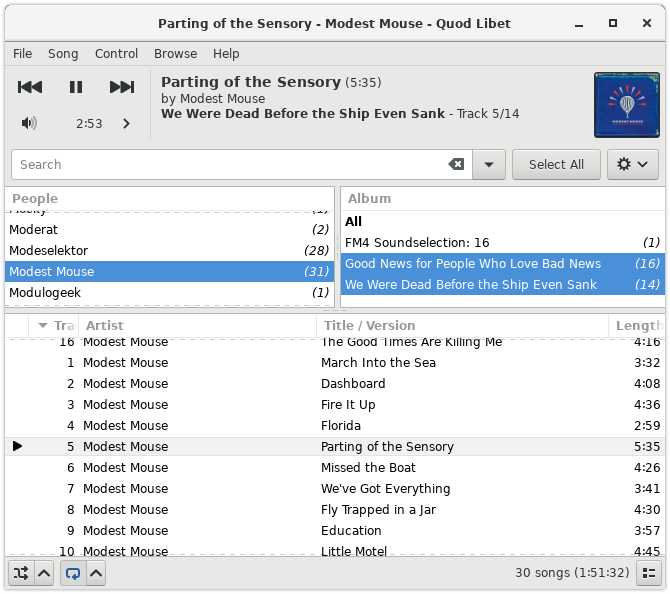 The Paned Browser offers a convenient way to quickly drill down into a large music collection, by narrowing selections in several stages. Some users may find this reminiscent of RhythmBox or, to some extent, iTunes. In Quod Libet though, you can have as many panes as you want, grouped by any tags you want, for example the popular ‘’genre/artist/album’’ and ‘’artist/album’‘, or ‘’artist/album/part’‘, or ‘’artist/album/artist’’ in case you have a lot of multi-artist albums. The songlist is presented at the bottom, and the panes, which run from left to right, are above. Clicking on an item (or items) in a pane will restrict it to just songs matching those (e.g. those artists, or dates, genres etc). This will update the counts and choices on the next pane, and the filtered results will be updated automatically in the song list. To change the panes, click the Preferences button all the way to the right of the search bar. There you can choose between some popular setups or set up custom ones using the add and remove buttons. You can change the order of the panes by dragging them to the desired place. Unlike elsewhere, multiple values per tag for a song are split into multiple entries. Tied tags also result in multiple entries. Tag patterns take multiple values from tags and from tied tags and produce multiple entries. Entries are sorted using sort values for tags. For tags with multiple values, each value is paired with the corresponding value from the sort tag. Quod Libet tries to do something reasonable when a value (e.g., “The Beatles”) sometimes has a sort value (e.g., “Beatles, The”) and sometimes does not or has a different sort values (e.g., “Beatles”).